Demjanjuk was convicted last year of assisting in the murders of 28,000 Jews during the Holocaust. Convicted Nazi war criminal John Demjanjuk has died at age 91. Demjanjuk was convicted in May 2011 of assisting in the murder of 28,060 people at the Sobibor death camp during the Holocaust. Demjanjuk was sentenced to five years in prison, but was released pending appeal. He died in a nursing home in southern Bavaria. Demjanjuk was born in Ukraine. After the Holocaust he moved to the United States, where he worked in a factory. Suspicions regarding his Nazi past were first raised several decades ago. In the 1980s he stood trial in Israel on charges that he was “Ivan the Terrible,” a particularly brutal guard at the Treblinka death camp. He was convicted and sentenced to death, but the Supreme Court later overturned the charges on the grounds that there was evidence that a different man was Ivan the Terrible, and returned Demjanjuk to the United States. The justices said they believed he had served as a Nazi guard, but could not be sure he was at Treblinka. 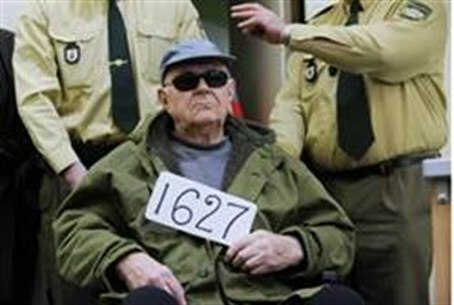 In 2002 his U.S. citizenship was revoked, allowing him to be brought to trial in Germany, where he was convicted of having volunteered for the Nazi SS after falling captive and of working at the death camp. The case was the first in which a person was convicted solely for serving as a death camp guard, with no evidence relating to a specific murder. Demjanjuk repeatedly denied the charges relating to Sobibor as well those relating to Treblinka, insisting he was the victim of mistaken identity.